We have ended our last day of September on a positive note! Our awards assembly today was amazing, and we had several parents able to attend. Always join us if you can! Our students rocked out being recognized for their learning and good choices as GBE Super Spartans! We even had our Senior Spartan Football Players here to hand out awards!! We ended our morning with a celebration for students and growth mind set moments. Every student received a lanyard and smiley pin for working so hard on their Star tests. They will have a chance with each Star Testing window to set and reach a goal. If they reach their goal they receive a new Button Pin to place on their lanyard for each area tested. The kids were excited to know at the end of the year they get to take the lanyards home with their button pins! Our goal this time was to have our students maintain their Star score in math and reading from their Spring or Summer School score. We have some who had a goal to maintain above their grade level since they did score over this range previously. If students were not able to reach this goal they were able to have some Growth Mind set moments and talks with teachers to look forward to the next window. These students were excited about growing and reaching their next goal. We felt this helps with knowing we have another time to try, we were just not there "Yet". The power of not getting it "Yet" is huge for our students to understand, and keep on trying. To ensure all students have a quality education and a sense of direction. Our PTO monthly meetings take place once a month on the last Monday. The meeting will begin each time at 5:30 pm. in the GBE Library. We always want more parent input and faces in our building. Knights of Columbus making a coat donation for our three Elementary schools in Moberly. We received a total of 60 coats. Mrs. Emily Seiner is our District Resource Coordinator that works with families to that have any need, such as coats, gloves, and hats. 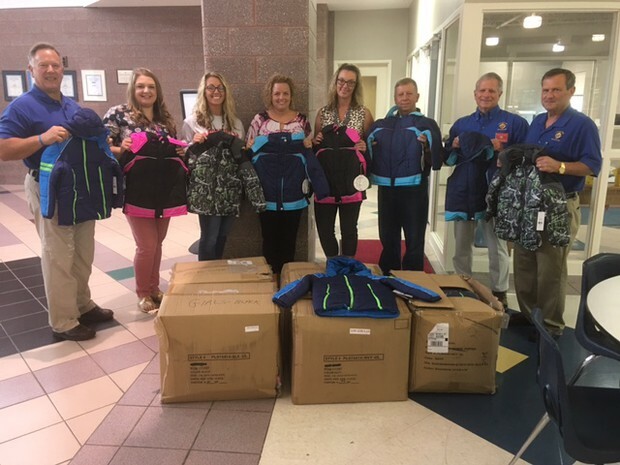 This is the second year that the school district has been chosen as a the recipient of the coat drive and is a huge blessing to our students in need. Feel free to detach the bottom portion of this newsletter to keep on the fridge as reminder to all of the events we have coming up this school year. Others will be added as the year progresses, but these are the events already set on the calendar at this time.